Pompeo departed from Tokyo on Saturday, where he spent the first leg of a tour that will include stops in Pyongyang, South Korea and China. Tokyo: US Secretary of State Mike Pompeo headed to Pyongyang Sunday for new talks with North Korean supremo Kim Jong Un on denuclearisation and a second US-North Korean summit. Earlier on Saturday, Pompeo held talkswith Japanese Prime Minister Shinzo Abe to try to unify the countries’ positions as he looks to arrange a second summit between President Donald Trump and North Korean leader Kim Jong Un and chart a path toward denuclearization. 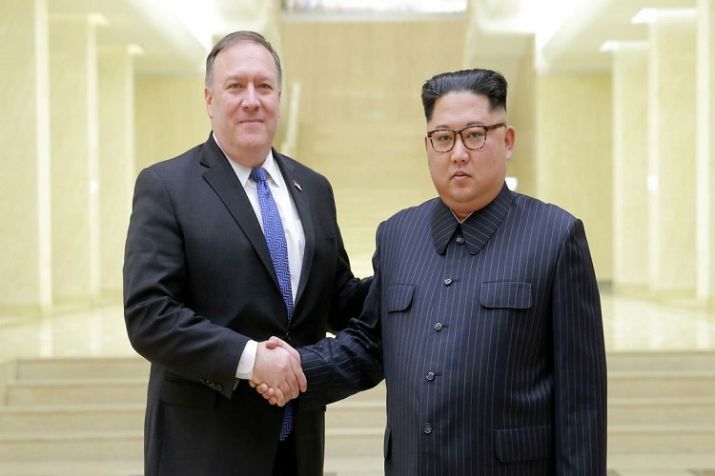 Pompeo said it was important to hear from the Japanese leader “so we have a fully coordinated and unified view.” Pompeo also pledged that during his meeting with Kim on Sunday, he would raise the cases of Japanese citizens abducted by North Korea. Trump scrapped a previously planned trip by his top diplomat to Pyongyang after what he said was insufficient progress towards implementing the terms of the Singapore declaration. But the unorthodox US president has since declared himself "in love" with Kim. While the US has pushed to maintain pressure on the North until its "final, fully verifiable denuclearisation", analysts say Washington may consider new options as China, Russia and South Korea seek to relax sanctions. Speaking alongside Japanese Prime Minister Shinzo Abe, Pompeo said the two historic allies would have a "fully coordinated, unified view of how to proceed, which will be what is needed if we are going to be successful on denuclearising North Korea." Japan, which has seen North Korean missiles fly over its territory and been threatened with annihilation, has historically taken a hard line on Pyongyang and stressed the need to maintain pressure on the regime. Pompeo, who has repeatedly declined to be drawn publicly on the shape of an eventual agreement, did not discuss the possible outlines of a deal, saying only that his "mission is to make sure that we understand what each side is truly trying to achieve".